The location for Fanad Head’s sign was identified via aerial photography done by TG4. From the photographs I’ve seen, the 9, and probably part of the frame are currently visible, but little else. I suspect this sign reappeared as a result of the weather in Ireland in summer 2018 and looking at the aerial photographs I used for the original search a few years ago, the sign is not visible on any of them. There is some evidence of stones in the area in the 1995 OSI photographs however, and from what I can ascertain, they align with the location of the 9 which has reappeared. The 9 is very similar to the 9 on Achill 59, and a few of signs which feature 6s. I will post this one as soon as I have the right to post a photograph. The location for Howth Head has been updated following updated information provided to me by a poster on Boards.ie. A lot of the early information for this site came through posters on that community website and again, it has helped a lot. This sign has been cleaned up and restored. I am really, really hoping to see it the next time I fly into Dublin. Map is of the Pennines but includes the east coast of Ireland and the LOP numbers are identified. See here. Map is by kind permission of the Oregan Chapter 8th Air Force Historical Society. A number of people have been good enough to bring my attention to two signs in Kerry which I was not aware of. 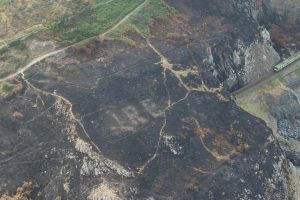 The Eire sign at Bray Head has been revealed following a major fire there in July 2018. The record for the sign is here, and the map has been updated accordingly. A map of still extant Neutrality signs is on Google Maps here. Images of the signs visible on Google and Bing Maps are sorted by county here. Updates to the site are posted here. Many years ago, in a piece about the lighthouses on the coast of Brittany, I saw a comment that the lighthouses were to tell the mariner where he was, and not just to warn him against rocks. In 1942-1943, a large number of signs were placed along the Irish coast to tell pilots where they were. Today, we take high technology navigational aids for granted. In the 1940s, GPS did not exist. In 1942-43, close to the locations of the coastal watch huts, signs were placed on the Irish coast to identify the land below as Eire, and not, for example, Great Britain or Northern Ireland. Shortly after the EIRE signs were constructed, mostly by the volunteers of the local Look Out Post (known in the documentation as LOPs), the identifying number of the relevant LOP was added, enhancing the signs’ value as a navigational aid. A list of LOPs, their locations and numbers were given to allied pilots thus allowing themselves to reduce the risk of crashing in the Republic of Ireland, and also, giving them greater detail on where they were. Currently available information suggests the signs were really only of use during the day, although according to Michael Kennedy’s work on the Coastal Watch (Guarding Neutral Ireland, 2009), fires may have been lit near some of the signs during winter nights. In researching this, I have learned a great deal about the coastal watch in Ireland during the Emergency, that great language by which we engaged in the myth that we were not at war. I have spent a great deal of time reviewing maps, satellite photographs and aerial photographs. A certain number of people have been very helpful in terms of locating these signs. Some of these people, I will not even know their real names. Time is not kind to these installations but a number of them in Mayo, Donegal, Cork and Clare have been recently renovated. In the Irish Military Archives G2 files for crashed foreign aircraft there is in one of the American files a copy of a document recovered from an abandined B-17 which if I recall correctly either lists the numbers or explains that they are listed on the nav maps given to crews. This was an Air Transport Command, Ferry Division document. I think I have something in a file from US National Archives. Here is a link to a page on the history of Clogherhead and it mentions the existance of an EIRE marker near the lookout post, I have searched for this and I am yet to find it. Lops still survive in substantial ruin at Greenore point no 13, Carnsore point, no 14 and Kilmore Quay no 15 in Wexford. I would be interested if these turned up. I need to check but I understood many were removed if the land was usable for crops or farming and this was particularly an issue on the east and south east coast. I’ve found the location of EIRE 11 at Cahore Point Co. Wexford from this Photo on Instagram. It’s not visible on bing might be gone or overgrown. I’ve also put together a Wikipedia page on these Eire markings and Lookout Post’s. also in County Wexford at Kilmichael Point LOP if you look at this point in the map you can posibly see an EIRE sign here http://maps.osi.ie/publicviewer/#V1,725336,666181,7,0 this might not be anything, it would probably require a visit to the location to confirm. Sorry posted link to LOP site this is the location that i can see something on the ground. Hi, just a small point. Although Ireland was effectively a republic during the Emergency, it was only officially declared as such in 1949. At the time it was known as Éire, or, in the English language, Ireland. EIR6 on Howth Head is clearly visible as a 20m diameter stone circle on Google Earth at 53° 22.966’N, 6° 3.145’W. I have not yet visited it – it is on farmland but it seems to be well maintained. No 57 near roonagh pier in mayo. I actually don’t have this one – I will get it added over the next few days. At st johns point lighthouse there is an eire 10/ eire 70 marking cant work out which, but it looks as if it has recently been restored as there is fresh dig marks, concrete and paint although it looks like its not completely finished as the eire marking is only half painted. Was just interested in any info about this. Thank you so much for this site, it’s brilliant. Found the one on Inis Mór last year, after a bit of a search. This project travelled to the LOPs in recent years. The St Johns EIRE 70 has been fully restored. The EIRE is at a 90 degree angle to the 70 and a short distance from it. It has been restored using natural stone unpainted (unfinished?) whilst the 70 is painted white. It can be seen (just about) in its pre-restored state on Google Earth. There is this other older site. Hi we were in Downpatrick today. It reminded us that there was one in Loughros Point Ardara. Co. Donegal. It’s partially covered over now. We’re not sure what number accompanied it. Malin Head was actually the first one I saw. At the time I had absolutely no idea what they were for. There is one on The Great Blasket Island, up beside the watchtower ruins. I am struggling to find this one. The aerial photographs for the Great Blasket on Google are cloudcovered, and the west side is not clear on the Microsoft photographs. I also have not been able to locate the watch tower ruins. Help would be appreciated. Thanks for this – I will update the map and site accordingly. I believe the associated lookout post was built later than the initial 82 look out posts. I’ve added it to the map and to the list for Kerry. Have a look at Mizen Head at 51.452519. -9.814934 which is lower on the hillside to website location. Looks more likely to me but interested to see what you think. I agree and have added it to the record for Mizen Head. Can anyone shed light on why there is no fada on the E on any of them? Just wondering if there were any markings along the border for aircraft to distinguish between Northern Ireland and Eire ? I don’t actually know, to be honest with you. That being said, they shouldn’t have been approaching Northern Ireland from the wrong side of the border as it were…until the Donegal Air Corridor went into effect, I guess. Have you any info on the Bundoran sign I advised you about last week. Fanad Head sign found by drone by TG4 cameraman yesterday. Fanad Head Eire Sign accidentally found by TG4 cameraman ! Hi there – currently verifying the location and waiting for access to a photograph. Thanks for the update. Drumanoo head Donegal has Eire sign but doesn’t seem to have a corresponding LOP . Would be interesting to know how many extra Eire signs there really are! Wondering if you found second sign in black head, Clare ?